The factory of earthenware St. Lukas was founded in 1909 by A.S. van Enthoven and Gerardus J.D. Offermans. Offermans had knowledge and experience with producing glazed earthenware and was specialized in the iridescent-high glaze technique, which was difficult and expensive. At these days the St-Lukas factory was the only factory in Holland that was specialized in this technique. 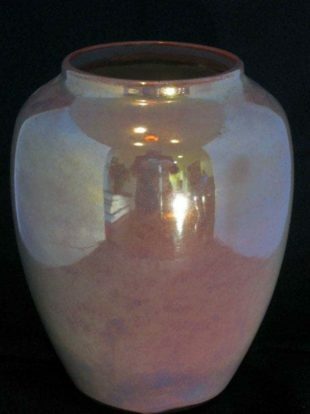 For the iridescent techniques little particles of noble metals, like silver dust or gold dust, were burned on the under glaze of the art object. During the baking the oxygen in the oven had to be reduced very quickly to a minimum with a very special temperature. 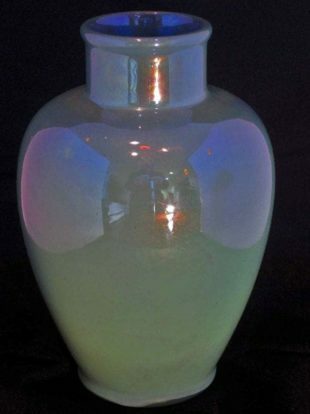 Only in this way there could arise an oil-iridescent sheen on the surface of the vase. The most valuable pieces are those with a naturalistic decoration. Wordlwide there was a great demand for the valuable vases of St-Lukas. For this so-called “reflet métallique” the founders of the factory van Enthoven and Offermans, received a “Diplôme d’Honneur” in 1910 on the World Exhibition in Brussels and a “Grand Prix” in 1915 in San Francisco and 1916 in San Diego.